Bangladeshi politics is once again at the crossroads. 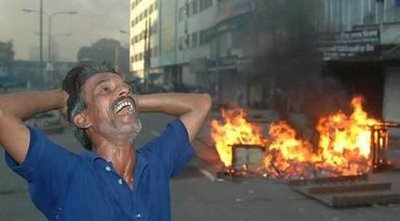 Impatient politics is eroding the economic stability in Bangladesh. Frequent violent activities in the name of politics have adversely affected the smooth growth of the economy. As continuous strikes and blockades are being called by the opposition party in demand of the Caretaker Government System, it has seriously put pressure on the economy to sustain. The uncertainty about the next general election and the accompanying political violence are real obstacles to our rate of growth. Although Bangladesh is experiencing the slowdown in economic growth, it has produced a development success story; both in terms of economic growth and social indicators earlier. The economy has been growing steadily for the past few years. According to the 2013 Legatum Prosperity Index (The Daily Star, November 4), Bangladesh is ahead of India in overall prosperity. In a ranking of 142 countries, based on a variety of factors including wealth, economic growth, personal wellbeing and quality of life, Bangladesh’s position is 103 while that of India is 106. Pakistan, by the way, occupies the 132nd position. Even though Bangladesh’s per capita income is about half of that of India, Bangladesh has a higher longevity rate, a lower infant mortality rate, lower undernourishment and better access to sanitation than India. Political turmoil in recent days has sought the concern of the economists as it became frightening. Strikes and blockades have shuttered industries and halted transport over more than 25 days in total since the start of November. This has cost the economy more than $4 billion, according to three leading trade groups: BGMEA, BKMEA and BTMA. According to DCCI, the daily losses are Tk. 1,600 crore while FBCCI estimates the losses at Tk. 10,000 crore. The garments sector, already hit by recent hartals and blockades (costing around Tk. 200 crore a day claimed by BGMEA president), has to deal with the ‘image crisis’. Violence and uncertainty will seriously hamper the progress. A report by United Nations Economic and Social Commission (ESCAP) in its Economic and Social Survey of Asia and Pacific 2013 predicts Bangladesh economy to grow around 6% in the current fiscal, lower than the government’s target of 7.2%. Inadequacies of infrastructure, global and political uncertainty have been cited as factors that may inhibit growth. The Asian Development Bank (ADB) says that GDP growth in current fiscal year may edge down to 5.7% due to global economic crisis and political turmoil in Bangladesh. Despite higher remittance, growth in demand for private consumption is expected to weaken. Though the government had earlier targeted a GDP growth rate at 7.2 percent for the current fiscal year, the Finance Minister AMA Muhith claimed that GDP growth rate at any event is unlikely to go below the last fiscal year’s 6.4 percent. The political unrest seriously hurt the export. Buyers have been leaving, no new orders are being placed, and previous shipments could not be made due to shutdowns and blockades. The transporting problem has been soared up. Despite the high payment, the exporters are not getting adequate number of vehicles to transport their products as the fears of sabotage, didn’t evaporate even after the special policing initiative on the highways. Thus, Export competitiveness may decline which can cause a fall in foreign trade. Investment – a crucial driver of growth – has been hindered as a result of political instability. Investment in private sector as well as in industrial sector has been shrunk for last few months due to political unrest. As investors lost their confidence, there has been a significant decline in growth rate of loans taken by the private sector as well as the considerable amount of idle money lying in banks. The situation seems paler as borrowers are not interested taking their approved loans and thus banks are passing a gloomy time in the middle of a sluggish investment demand. Excess liquidity of Tk.820 billion existed as of August 2013. Hartal retards local and foreign investments, reduces employment opportunities and creates obstacles to future growth of the economy. Moreover, wholesale markets and large commercial and shopping centers are counting losses every day. Lower economic activity also translates into lesser revenue for the government; in the face of a high public expenditure, the government may have to borrow in order to bridge the fiscal gap, and this entails interest rates. The revenue board fell short of target by Tk 3,119.68 crore or 8.58 per cent in July-October of FY 2013-14. In the period, the NBR managed to collect Tk 33,492.84 crore against the collection target of Tk 36,612.52 crore, the data showed on the website (www.nbr-bd.org). And the cause they showed is the political instability. Prices of food have soared in cities due to disrupted supplies. As there are shortage of necessary goods at the retail market due to prolonged strikes and blockades, the prices have increased. Naturally, the prices increase, often beyond the purchasing power of the common people. Political stability in the long run could ensure relatively stable price. The farmers became worsen off greatly because of inadequate medium of supply of their yielded products. A lot of produce has been left rotting, with Lorries and Trucks unable to move them to towns and cities for sale. Which also a cause of price rising. Food inflation in October accelerated to 8.38% from 7.93% in September this year. These kinds of effects of hartals tend to be ‘regressive’ in nature, implying that lower the wage of the individual, higher will be the burden of hartal. Though we are going through the political vacuum, it should end a prolonged political turmoil that will only hinder Bangladesh’s economic growth and destroy consumer spending. It may be best if both sides could opt talk rather than confront each other. Both the ruling and the opposition party should be aware of such incidences that are affecting the economic stability.